The Kinetics 8-speed Brompton conversion uses a Sturmey Archer hub gear with a very wide range – the X-RF8(W) has a 325% gear range*. Compared to Brompton’s 6-speed option, it is a wider gear range with only one gear shifter – a low profile twist shifter. All 8 gears are in sequence, so it’s easier to use than the 6-speed’s twin-shifter system, and any gear can be selected while stationary. The smaller front chainset keeps the drivetrain further inside the folded package. No modification of the frame is needed. I can fit the 8-speed to an existing Brompton for you, or I can send you a kit. The kit includes the complete back wheel, chain tensioner, gear shifter and cable, and replacement chainset. You’ll need a few spanners, and a few allen keys – fitting is not hard, and takes about 30 minutes (see the instructions here). *I normally use a 20t rear cog and 33t front chainring, to give ratios of about 29″ to 95″ (2.3m to 7.5m). i have a 3 speed brompton. i can use 8 speed kit? Yes, the kit will fit any standard Brompton. This can be fitted in a carbon wheel (ORZ, etc…) instead of a regular wheel? I’ve never tried, but as long as it’s a 28h rim it should be fine. what is the weight difference in comparison to the standard 6-speed (3-speed hub + derailleur) setup? J have a 2 speed, light titanium version, 2012 I would know if the dimension is correct without modification of the frame.? The axle width is fine, but some titanium frames need a little bit filed off the chainstay where the cog is. If I ordered the kit for a titanium version (2017) is this something I could deal with myself? Do you have any pictures of this? It needs some metalworking, so depends on your skill level – it can be done with care with an angle grinder. Can you offer this kit with 30t front chainring and new chain to fit? I just acquired a 2 speed S model. Would this be the genesis of a 16 speed, or is that just silly? The cog sizes are different, I’m afraid – the 8-speed hub will only take a single 20t cog. I’m glad to find this before ordering my first Brompton. Needn’t bother with any of their gearing options now, none of which appealed to me. Gear range appears to be comparable to my current Sachs Super-7 bike (31.8″ to 96.5″), and I use all seven. Will this work with a single-speed Brompton? Yes, it will work with any Brompton. What is thje over locknut distance distance of the hub you use ? Is it the standard 120mm of the standard X-RF8(W) hub that requires a slight widening of the Brompton rear triangle or do you reduce the hub over locknut distance distance to 110mm ? I reduce the hub to 115mm to fit the Brompton frame with no spreading. Hi, do you ship to Canada? Will The local Brompton retailler Know How to install it? Yes, I ship all over the World. Any decent bike shop should have no problems fitting it. I have a 6 speed brompton. If I buy the kit, is there anything else I need to install it? Depending on the age of your chain, you might need a new one. I got your 8-speed SA kit very quickly (very fast shipping to the USA) and I had the bike shop DIAMOND CYCLE in Monclair New Jersey install it (which they did in a day). I love this setup over the dual shifter 6-speed and I can more easily take on hills with the lower overall gearing. I have a 6 speed if I put this kit on will this make it a 16 if I use the derailleur with ? No, the derailleur cannot be used with this hub, the sprockets are completely different. Does the kit come with a 20 cog? Yes, that’s the only cog that fits. kit add to a 2017 M2L? can you fit a smaller chainset than the 33t to make the gearing smaller? Suitable chainsets are quite hard to find – in theory it’s possible to go down to about 30t without causing problems, any lower and the chain hits the wire cable loop on the chainstay. What is the metres of development? I’m interested in the 8gear conversion, How would it work on a P-type handle bar? The twist shifter works pretty well on a P-type, unless you’ve got the older plastic brake levers – in that case, the thumbshifter is probably better. Yes but how will it work? I.e. Where on the bar it will be fitted ? On top/ around the curl…? It’d go on the top – it won’t fit around the curve. Can I order the kinetic 8 speed kit with twist shifters on a brompton from you? I didn’t see it as an option on the custom bike form. No, I don’t build complete bikes with the Sturmey kit, only with Rohloff, Alfine or NuVinci kits. I’ve done the conversion, it only took an afternoon but if you aren’t handy with spanners, I reckon any local bike shop would do it in a 1/2 day. Would this kit work on an old Brompton that does NOT have the lug on the rear triangle for mounting the derailleur? I presume there is a single cog on the rear hub? Yes, this kit does not need the derailleur mounting – on old frames, the dropout spacing is a couple of mm narrower so you might need to spread the frame a little bit to get the wheel in. I have a 6 speed with a Schlump mountain drive. Would this 8-speed-kit work on my brompton? Would the Schlumpf Mountain drive have the same effect on the 8-speed-kit as on the 6 speed? I have built bikes with the 8-speed kit and the Mountian Drive – it works fine. It depends what chainring you have, but typically a 50t would give a very good range. I have a 6 speed Ti Brompton with the +8% gearing option(54T) chainring. I believe this give sa 108″ gear with which I’m happy. Would the 8 speed be able to obtain this gearing? Yes, with a 38t chainring. If I go to Glasgow, is it possible for you to assemble this 8 speed hub the same day? Yes, I did one today, it takes about an hour – but I need some time to build up the kit first, I don’t usually keep them in stock. 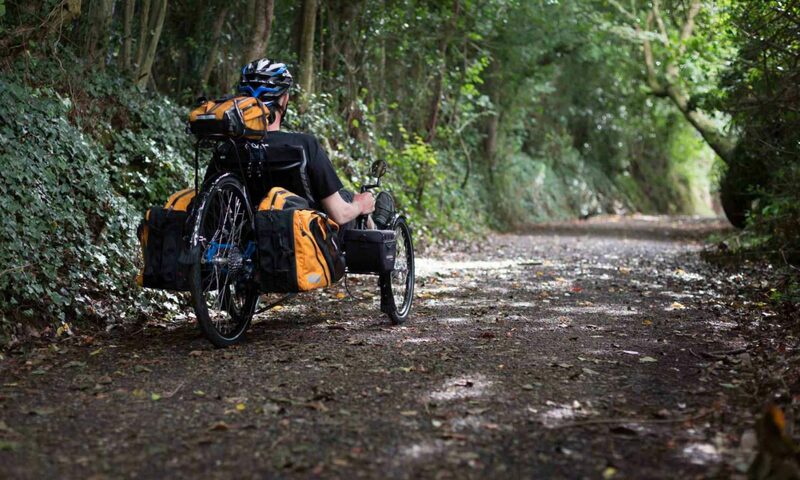 And is it ok for a Brompton M1E? Is it possible to use the same rim? I saw also something you did with a Alfine 11 speed. Is it possible to assemble something like it without disk brake? How much shall I pay for the Rohloff and/or the Alfine? I’m very interested in buying a 1-speed M-type Brompton bike and then add your 8-speed Sturmey kit to it. The 8-speed kit comes with a new chainset, as it needs a much smaller 33t ring, so it doesn’t matter what your bike has. The folded size is the same – the standard left wheel nut that comes with the kit is a little longer, if that bothers you then you can use one of the original wheel nuts. We recently bought two used 5-speed Bromptons, dating from around Y2000 (so it’s probably the shorter wheelbase type). On one of the bikes, the Sturmey 5-speed is a bit wonky. Assuming I’m not able to get it to shift reliably: how much weight would your 8-speed setup add, approximately? Am I right in thinking I’d need a 28T front ring to get something similar to a 22” hill climbing gearing? That would give me a range of 22-72” is that right? Are you able to supply a 28T or 30T front ring…? The problem with going smaller than 30t is that the chain hits the cable keeper loop on the chainstay. Hi. Is there any reason why a 32 tooth chainring will not work with this set up? If I was to try and do a conversion myself the 32 size is more commonly available. Are there problems with crank length bolt hole diameter chain size chain line etc? Are there any parts problems when reducing locknut dimension and chain tensioner mods? No reason why not, it’s just that single 32t chainsets are hard to find. The chainring needs to be pretty close to the chainstay, so fitting a standard ring to a double or triple chainset might not work. You must have fitted quite a few of these by now. How reliable is the eight speed hub? Over a hundred I think! The early hubs were a bit fussy about adjustment, but the current wide-range ones are very good. The only problems I have sometimes are with the twist shifter, it’s a bit plasticky. The aluminium thumbshifter is great. Is it possible to fit a front ring small enough to get a bottom gear about 20″ (top would I guess be about 65″) with the SA 8 speed? I think it’d be tricky – that would need a chainring of about 23t, and anything smaller than 30t causes problems with the chain hitting the wire cable loop on the chain stay. Of course you could remove that. 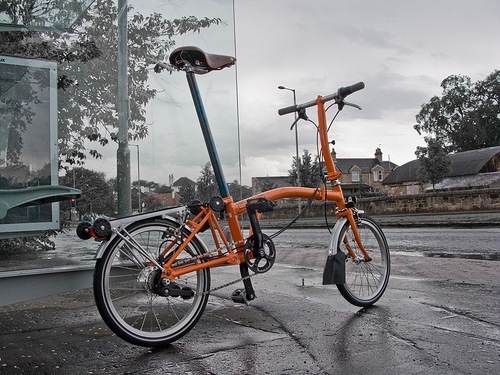 Hi there, I’ve just bought a new Brompton (one of the nice looking Nine Streets special editions) and have realised that the M type handlebars have changed quite radically. The brake lever, gear shifter and bell are all integrated and the shape of the handlebar is subtly different. Have you had any success fitting the eight speed kit to a 2018 Brompton with the redesigned M handlebars? Yes – the gear shifters are removable, and the bell can be moved to the other side. But the thumbshifter is a better option than the twist on H and M bars. This will fit on a Dahon presto with Sram T3? No, it’s only for Brompton folders.